This modified version of Charles Brannon's "TextPlot" runs more slowly, but adds many features for fancy text displays. "Super TextPlot" is a machine language utility that lets you plot character images in any Atari graphics or text mode. The idea for the program was inspired by Charles Brannon's "TextPlot" utility (COMPUTE's First Book of Atari Graphics). Super TextPlot provides the following capabilities. 1. Plots the entire ATASCII character set, including upper/lowercase, graphics characters, special symbols, and the reverse video version of each of these characters in any graphics or text mode. Alternate character sets may be plotted by changing the CHBAS vector (location 756) to point to the alternate character set. 2. Allows the user to specify a string of characters to plot. The only length limitation for the string is that it must fit in the display area when it is plotted. 3. Allows the user to specify the starting position of the string to plot. This position can be any (X,Y) coordinate on the display. 4. Gives the user the option of overwriting the graphics already on the screen or of merging the plotted characters with the existing graphics. 5. Allows the user to select which color registers are to be used for the foreground and background of the characters plotted. 6. Allows the user to scale each character string independently in the horizontal and vertical directions by specifying the number of rows and columns for each character. The actual size of each character varies with the pixel size of the graphics mode selected. Many different-sized characters can be plotted on the same graphics screen. 7. Allows the user to select one of four angular orientations to plot each character string. The four available orientations are 90 degree increments from the horizontal. All of these capabilities are available using one simple invocation of a machine language routine from the USR function in BASIC. The derivation of these formulas is shown in Figure 2. ADR(ASM$) This parameter is the starting address of the Super TextPlot routine. Since the loader for the routine uses a character string (ASM$) to reserve space in memory for the routine, the starting address is merely the address of this string. ADR(S$) This parameter is the address of the string to be plotted. Usually it will be the value returned by the ADR function for the string since this is the first character in the string. However, any address is valid. For example, the address could point to a sub-string contained in a long string. LEN(S$) This parameter specifies how many characters are to be plotted. The LEN function provides the appropriate value if the entire string is to be plotted. Other values may be appropriate for plotting sub-strings. If this parameter is zero, nothing is plotted, and the USR function simply returns to the BASIC program. XS,YS These two parameters specify the (X,Y) coordinates of the starting position of the string to be plotted (lower-left comer of the first character). This point is also used as the pivot point when the string is rotated (see ORIENT parameter). (XS,YS) must define a point within the limits of the current graphics mode. 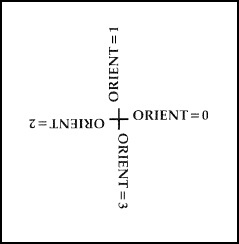 The value of ORIENT is interpreted MOD(3) so that ORIENT=4 is the same as ORIENT=0, ORIENT=5 is the same as ORIENT=1, etc. The high byte of the two-byte integer passed by the USR function to the machine language routine is ignored. Figure 3 illustrates the orientation of strings plotted at each of the four orientations. NROWS The parameter specifies how many rows per character are to be plotted and therefore determines the height of each character. Normally, NROWS is greater than or equal to eight; however, positive values less than eight are valid and will result in characters plotted with "missing" rows. This may be useful for crowding strings into a limited space, or it may simply produce unreadable characters. If NROWS is zero, nothing is plotted, and the USR function returns to the BASIC program. The maximum acceptable value for NROWS is 255 (the high byte of the two-byte integer passed to the machine language routine by the USR function is ignored). NCOLS This parameter specifies how many columns per character are to be plotted and therefore determines the width of each character. 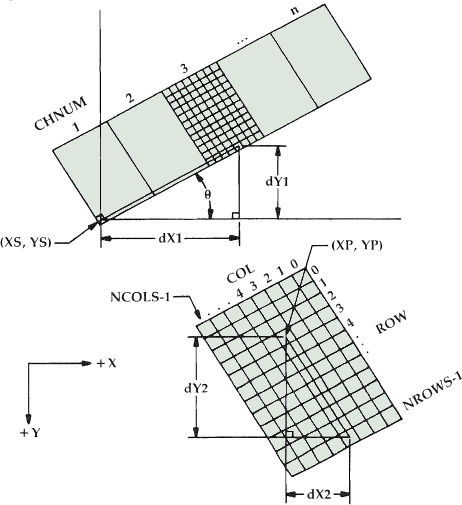 The restrictions on the range of values for this parameter are the same as those specified for the NROWS parameter. FCR This parameter specifies the foreground color register to be used when plotting the string. This indirectly specifies the color of the characters plotted in the framework of the standard SETCOLOR-COLOR concept embodied in the Atari BASIC language. In text modes (GRAPHICS 0-2) this parameter should be specified as an ATASCII code. Using Super TextPlot in this manner allows block printing of character images which are typically used as headers to identify printed listings. For example, FCR=160 would use the reverse video space to plot large characters in GRAPHICS 0. BCR This parameter specifies the background color register for each character. The comments regarding the use of FCR in text modes also apply for this parameter. If the value of the parameter PRIOR (see below) is zero, then the BCR parameter has no effect on the characters plotted. PRIOR This parameter specifies the priority of the background of the character string plotted. If PRIOR is zero, the background of the characters is not plotted and existing graphics on the screen will not be disturbed. If PRIOR is a positive value, the color specified indirectly by BCR is plotted for the background (this color may be black). The Super TextPlot routine does not check to make sure that points plotted to form a string fall within the bounds of the display area. The user must insure that all the points to be plotted will fall within the display limits. Plotting points which are out of range usually results in a system crash. Specify normal characters in the string and reverse the values for FCR and BCR. If the parameters FCR and BCR are assigned the same value (and PRIOR is positive), the string will be plotted but will appear as contiguously colored blocks. If an improper number of parameters is specified in the USR function statement, Super TextPlot will return to the BASIC program but take no other action. The value A returned by the USR function has no significance. One of the problems associated with writing utility routines in machine language is determining a safe range of memory locations which can be used to store the routine. This problem is complicated by various available memory configurations, memory used by custom display lists, player/missile graphics, and other machine language routines. Super TextPlot solves all of these problems by providing the machine code in a relocatable format. All of the addresses in the DATA statements are relative addresses offset from the beginning of the routine. These addresses are flagged as minus numbers in the DATA statements. When the loader routine is invoked, it reserves a character string (ASM$) in which the machine code is stored. As each instruction code is loaded into this string, the addresses are modified to reflect the actual memory locations utilized. Since Super TextPlot is a utility program, it can be treated as an extension to the BASIC programming language and therefore becomes one of the tools available to a programmer. Obvious examples for the use of this routine include labelling graphs and bar charts, adding text to graphic game displays, and developing colorful and attractive message displays. Super TextPlot can be an effective marketing/sales tool. A variety of textual messages can be displayed on a demonstration computer system in order to attract customers and provide information in an eye-catching format.